The long-anticipated MyFigueroa project made another appearance at the Los Angeles City Council’s Planning and Land Use Management (PLUM) committee yesterday. With more than a hundred supporters in attendance, a great deal of staff work, political leadership, and a stakeholder summit process underway, it appears that MyFigueroa may be on track to break ground some day in the not too distant future. The PLUM committee heard from staff and the public, made requests based on recommendations that came from a stakeholder working group, and pushed the item off for three more weeks. MyFigueroa is expected to include the city of L.A.’s first significant stretch of protected bike lanes, as well as various improvements to make all road users’ experiences safer and better. The project extends from Downtown L.A. into Exposition Park. In the works since 2008, the project snagged on auto dealership (Shammas Auto Group) opposition in 2013, and has been stalled, churning its way through City Council committees ever since. Yesterday’s PLUM hearing began with a presentation by staff from the Department of City Planning (DCP) and the Department of Transportation (LADOT.) Staff responded to L.A. City Councilmember Curren Price’s motion (13-1124) directing staff to analyze “[a]lternatives … to removing traffic lanes on S. Figueroa Street.” My Figueroa proposes removing one southbound travel lane on South Figueroa (from 7th Street to Martin Luther King Blvd) to add two-way protected bikeways. Price and others have expressed interest in a paired couplet of one-way bikeways instead: northbound only on Figueroa Street and southbound only on adjacent Flower Street. DCP and LADOT reported that they had analyzed this Flower couplet possibility, but advised against it, as it would require removing two travel lanes on Flower, resulting in “more traffic bottlenecks” than the MyFigueroa project as planned. Following the staff presentation, Councilmember Price’s Deputy Chief of Staff Paloma Pérez-McEvoy and Mayor Garcetti’s transportation staffer Marcel Porras stepped to the podium. Pérez-McEvoy and Porras related that, last week, Price, Garcetti and Councilmember Jose Huizar had convened a 4-hour “summit” meeting of Figueroa corridor stakeholders and bike advocates. Pérez-McEvoy expressed that the meeting had gone well, but that there were still some “small” issues including ingress and egress, traffic impacts, and procedures for closing lanes for filming. Porras reported that the summit was pulled together quickly, had gone well, and that parties were all working together. Public comment was heavily in favor of building MyFigueroa as planned without delay. Speakers included youth, downtown and South L.A. residents, USC students, and organizational representatives from the Los Angeles City Planning Commission, the L.A. County Bicycle Coalition, and others. At one point, after more than a dozen supporters had spoken, City Councilmember Mitch Englander suggested that he was hearing “a lot of the same” and requested a show of hands in support of MyFigueroa. Roughly a hundred hands shot up. Englander requested that the public testimony proceed quickly, so the PLUM committee could act in favor of the project. A handful of speakers expressed caged opposition to MyFigueroa. South Figueroa Street institutions, including the California Science Center, USC, the Motion Picture Association of America (MPAA), and the South Park BID expressed concerns, but stated that they supported the stakeholder group process. Crucially, Dominick Rubalcava, the attorney representing Shammas Auto Group, stated that he was authorized to state that his client “will withdraw the appeal” if consensus is reached by the stakeholder summit group. After testimony concluded, PLUM Committee Chair Huizar also expressed optimism about the stakeholder group’s process. Huizar requested that staff look into proceeding with the project’s non-controversial 11th Street spur initially, while issues are being worked for Figueroa Street. Huizar and the full committee approved all five requests from Councilmember Price, and additionally that the item be continued (basically placed on hold) and return to PLUM committee in 3 weeks. The stakeholder summit is a closed-door process, difficult to assess fully solely based on today’s PLUM testimony. It’s unclear what the real crux of the disagreement is. Are the real concerns “small” ingress/egress design issues? or a broader preference for the existing congested conditions over MyFigueroa’s vision of a vital walkable bikeable future? Time will tell. The five requests (below) that emerged from the summit represent a significant amount of DCP and LADOT staff effort. The effort will all be worthwhile if it’s what’s needed to achieve a stakeholder consensus. Hopefully, in three weeks, under the leadership of Mayor Garcetti and Councilmembers Price and Huizar, a consensus will be hammered out respectfully. And that consensus will allow the MyFigueroa project to finish its 6-year planning gestation and begin on-the-ground implementation. (1) Receive and file today’s report. – and request for the appropriate staff to quantify and report back the actual expected delays, as opposed to the analysis in the EIR as well as preparing an educational/marketing campaign for implementation of this project. (2) Further analysis is needed in regards to the MPAA’s concerns that would address specific concerns regarding lane closures for filming purposes. Request that DOT meeting with FilmLA, MPAA and other industry stakeholders to discuss how filming/lane closures will occur once MyFigueroa plan is adopted. (5) Create an advisory board for the post-evaluation studies that includes representatives from the Figueroa stakeholders. I am very glad to hear that the Technical Working Group will be addressing issues of ingress/egress to Expo Park. Today, there is zero signage anywhere at Expo Park directing bicyclists to parking locations at the park. From Figueroa–the side where many bicyclists will now be arrriving–the only signage directs people to the parking structure, where Expo Park rules provide: “The riding of bicycles . . . is not allowed in the parking structure. . . ” The only convenient way to get to the bike parking from the main entrance off Figueroa is to ride on walkways, although the Expo Park rules also state: “The riding of bicycles . . . is not allowed . . . on pedestrian walkways.” I am thrilled that the Science Center and Expo Park are committed to clear, safe bike access to the myriad of cultural facilities there. Or did I misunderstand, and is the Science Center Board only concerned about automobile access? 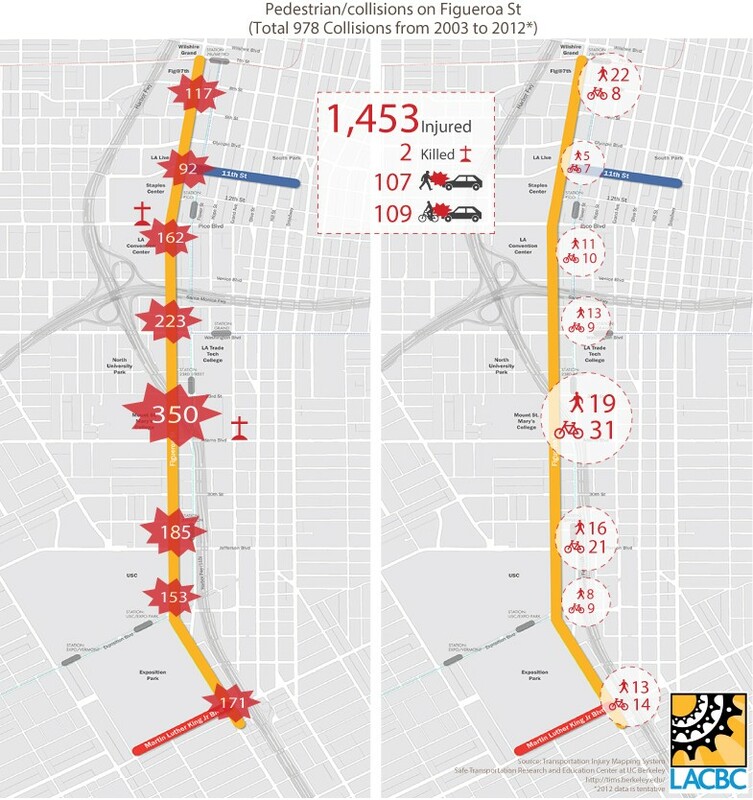 It is a wonderful and telling map that LACBC has made, but are we certain that the people killed along Figueroa were True Believers in the Son of God, Jesus Christ, Our Lord and Saviour? LOL – oh yes, you most certainly did! Their concerns are all about auto ingress and egress, especially the car service customers at the auto dealership. The people who work at the other large institutions don’t live nearby so they have a windshield perspective on the whole topic. Dissent on this issue is from the top down. That is such a bummer to hear! I got excited for a moment reading Jeff’s comment and thinking that maybe, just maybe, the folks at these important institutions were thinking ahead to their place in our community and how we connect to them 10-20 years from now, than to what we as a community and they once were 20-30 years ago. Wake up and smell the 21st century, guys. Yeesh. Incredibly disappointing given the schools in the area with students who visit the science center by walking or taking metro there. It sends a message for sure. Garcetti Has Skin in the Game on My Figueroa! Scofflaw drivers are making MyFigueroa less safe for bicycling and walking.